Ideal for cleaning the interior and exterior of grain, pet food and food processing silos, bins and equipment, Mole•Master’s™ Abrasive Blasting services are an environmentally friendly and cost-effective method for keeping silos and bins at peak efficiency. Sodium bicarbonate, when blended with compressed air, literally blasts away surface materials without damaging the substrate. Often referred to as Soda Blasting, abrasive blasting also provides excellent results for decontamination and removal of certain types of mold and bacteria. This is particularly important in the grain, pet food and food processing industries. The media, when blended with compressed air, literally blast away surface materials without damaging the substrate. Our abrasive blasting systems are comprised of a blast generator, high-pressure compressed air, moisture decontamination system, blast hose and nozzle. Contact us today to learn more about our Abrasive and Soda Blasting Services. Review the frequently asked questions below to learn more about abrasive blasting. Contact Mole•Master for assistance with all of your media blasting needs. Q. What is abrasive blasting? Q. Under what conditions is abrasive blasting a preferred method? Q. How does an application determine what kind of media will be used? Q. What is the preparation process for an abrasive blasting job? Q. What safety precautions are necessary during an abrasive blasting job? Q. How can a customer tell that an abrasive blasting service is being performed correctly? Q. What are the advantages of abrasive blasting over other methodologies? Q. How long does an abrasive blasting job usually take? Q. What is the clean-up process like after an abrasive blasting job? A. Abrasive blasting involves a stream of media forcibly propelled against a surface under high pressure for surface preparation or the removal of contanimants, rust and coatings. – back to top –Q. Under what conditions is abrasive blasting a preferred method? A. Abrasive blasting is the preferred method when a customer wants to prepare any surface so that a subsequent coating will adhere properly. – back to top –Q. How does an application determine what kind of media will be used? A. An experienced abrasive blasting provider will consider the desired profile and the location of the work site to select the appropriate media for the job. – back to top –Q. What is the preparation process for an abrasive blasting job? A. Preparation can be very minimal or the biggest portion of the project, depending on whether the project site is in a heavy populated area or an isolated area. – back to top –Q. What safety precautions are necessary during an abrasive blasting job? A. 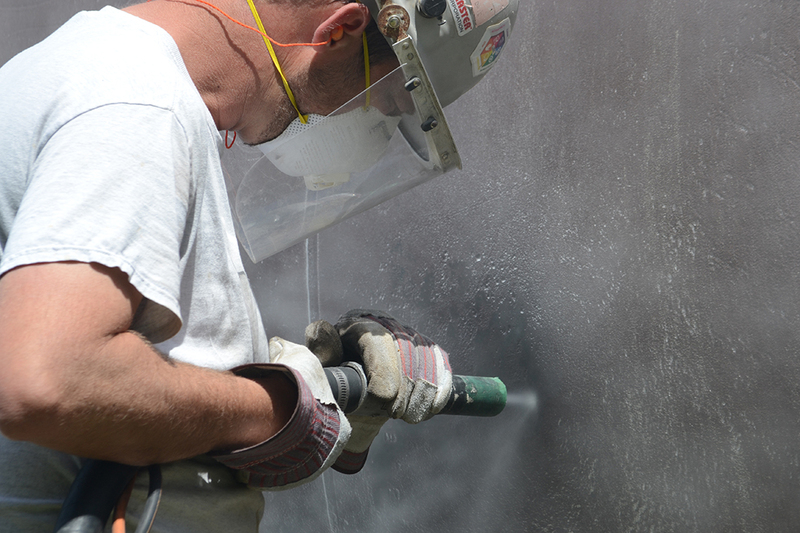 The most common safety precautions during abrasive blasting are presented in OSHA guideline 29CFR 1910.1200. – back to top –Q. How can a customer tell that an abrasive blasting service is being performed correctly? A. The customer should check the coating literature, which will explain what surface profile is needed per Society for Protective Coatings standards. – back to top –Q. What are the advantages of abrasive blasting over other methodologies? A. The main advantage of abrasive blasting is that it provides the quickest method of surface preparation. – back to top –Q. How long does an abrasive blasting job usually take? A. The average strip rate during a coating removal is 2 to 3 square feet per minute, while the rate for a brush blast is 12 to 15 square feet per minute. – back to top –Q. What is the clean-up process like after an abrasive blasting job? A. 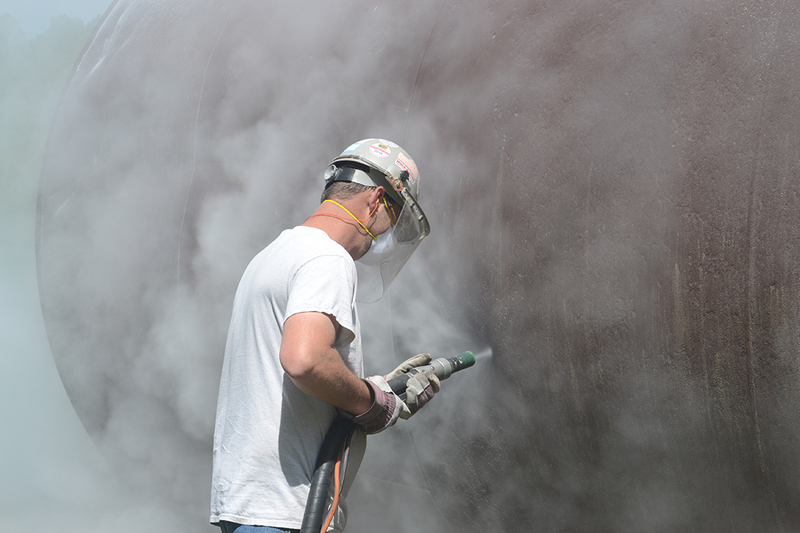 An abrasive blasting job requires a significant amount of clean up, like most other blasting methods. The only exception is dry ice blasting, where the media used dissipates upon impact, leaving only the removed contaminants to be cleaned up.